So excited for warm weather and the chance to wear my kimonos again! I love wearing dresses in spring, so dresses and kimonos together make me happy. A quick errand in the morning, my local ABA mother's group meeting and then a doctor's appointment for Baby Boy in the afternoon. As it was such a hot day, I wanted something nice and easy to wear. I knew I wanted to wear this dress again, but wasn't sure what kimono to wear with it. In the end I settled on this tribal print kimono as some of the print is similar to the Aztec print on the dress. The night before I held them up side by side and figured it would look okay. When I put it on in the morning, I loved this outfit. I like the extra colour the kimono adds to the dress, and this was perfect for a day with a bit of running around. This dress is loose and flowy and knee-length on me so it's just as good for a doctor's appointment as it is sitting down on the floor chatting to my mum friends who have younger babies doing tummy time. I wouldn't change anything about this outfit. So glad I was able to buy this dress at the end of my #6MonthsWithoutShopping challenge, I've loved it every time I've worn it. Last worn: red tribal print kimono, black Aztec print dress, studded sandals, Rebecca Minkoff grey Love bag. Other ways to wear: red tribal print kimono and gold jeans, black Aztec print dress worn two ways, studded sandals and maxi dress, Rebecca Minkoff grey Love bag and flares. Perfect for pregnancy: red kimono and maternity tank, studded sandals in second trimester, Rebecca Minkoff Love bag in third trimester. Another doctor's appointment! Vaccinations for baby boy meant we were going to have a quiet day. After the doctors, we headed out to do a little shopping and take part in a fun plant pot decorating activity for the boys. Surprisingly we have managed to not only keep the seeds alive, they are now sprouting quite nicely! As someone who has killed succulents and cacti I'm quite proud we are keeping these plants alive so far. At least I liked my outfit, plenty of people saw it when they looked around to see where the screaming child was! Toddler tantrums are just an unavoidable part of motherhood. 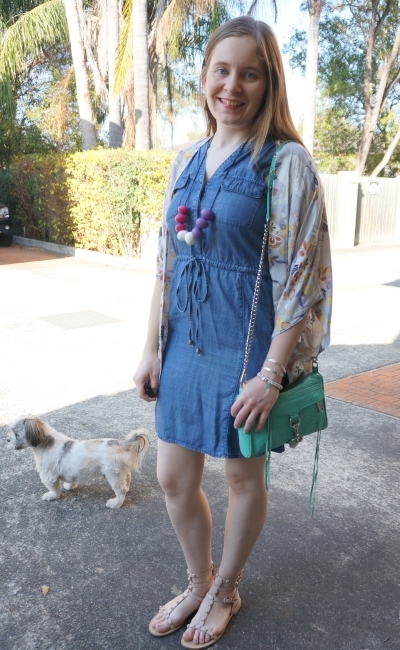 Last worn: floral kimono, chambray dress, studded Rebecca Minkoff sandals, Rebecca Minkoff aqua mini MAC. Other ways to wear: floral kimono and striped tank, chambray dress and ankle boots, studded Rebecca Minkoff sandals worn 30 ways, Rebecca Minkoff aqua mini MAC and graphic tee. Perfect for pregnancy: kimono and maternity shorts in second trimester, chambray dress and second trimester bump, mini MAC and non-maternity clothes in third trimester. Kimonos work perfectly in spring when you need a light layer. While they look wonderful with denim shorts and jeans, they look equally good worn with dresses. It's a quick and easy spring outfit. If you're unsure what kimono to wear with your dress, you can pick one with a similar print, or add some more colour and print with a kimono over a plain dress. Linking up with Flashback Fashion, Friday Favourites, Shoe and Tell, Mix It Monday, Hello Monday, Modest Monday. Loove the kimono over this! So cute! Hi Mica! You look super cute as always! I love how you accessorized with your bags. Oh and I'm glad to see that the weather is more pleasant! I pray you have a wonderful rest of the rest! Nice to see your short bohemian dresses, you look really good in them. Love the print and colour of the first one. Beautiful black bag! I like it! These are the most versatile pieces, especially in the summer. They can add so much interest to any outfit!! i love spring too. it is spring too here in Australia, am so excited and longing forward toward to the summer. i love your style. Perfect post, I love these stylish looks! Thanks for sharing! So happy you're getting a better weather day by day but a little envy because we're in the middle of fall. I like your dress a lot - it's so boho! How's your sick baby feeling? Thanks - he was feeling much better! I do love a good kimono - the color on yours here is great! It's always nice to have flowy, easy pieces for hot days. Yep it's definitely a story every mum has! :) And it's good to think of different ways to wear my kimonos. I've always liked the boho style and this is perfect for our warm weather now!! I love the bag in your first series - so cute and I bet you can pair it with most things. How do you find the energy to swap everything in your purse?! Haha - I'm hopeless! I carry the same bag filled to the brim with rubbish all the time! The first dress is so pretty! You always have the best accessories! I love the mint green bag. It reminds me of the color of mint chip ice-cream! Hope you have a great weekend! I really like that first dress. The kimono adds so much to the look! Also that denim dress is super cute and really versatile! the black dress is so pretty, love the pairing! These easy to wear dresses and kimonos are gorgeous. Especially like the first kimono, really pretty. Thanks, he is feeling much better! Yes I love kimonos! And a big yes to the toddler tantrums! KImonos are a great investment as you can get so much use out of them over the warmer months but I'm sure the UK have a horrendous supply of then, as they are not nearly as yours! Love this easy breezy style! haha luckily they don't last long! It is so impressive you keep your good mood also when one of your boys has a tantrum! You are definitely a good mum and I like it and it is laudable you are so strict. And I like both of your outfits, too! The idea to wear the dresses with are kimono are absolutely convincing and you look beautiful and fresh. I absolutely adore the first dress, would be perfect for my upcoming holiday to Fuerteventura! Ahhh I'm craving some warm weather again! Loving the Rebecca Minkoff bags too! Oh, you poor thing - never that that kid live his tantrum down, ha ha! You look chic and awesome in both of these looks - the wonderful power of dresses! haha fact of life with toddlers sadly! I love your kimonos - they are such great warm weather layers when you want to mix up your dresses - and I don't have any in my closet! Maybe I need to rethink that. Good for you on holding your ground when your boys wanted a toy and had a tantrum. So many other parents would have just given in. haha was easy to say no when he'd just got 2 trains the day before! I love both of these looks--you always have the cutest kimonos! They do make us leave early sometimes! I love your outfits. The kimonos add a lot and I love the light weight for the warmer months. I really love the dress in the first picture too. That's boho done right Mica! I love both outfits, but I am so smitten with that first one. You look so cute. Vaccinations are so important! I always admire your kimono collection and just got one this summer. I haven't tried it with a dress yet though and I think I need to! My daughter used to sometimes have fits in stores and it was so hard. Now she is a little older I can explain to her that we need to save our money for fun things like trips! I also started a wish list on my phone for her bday and Christmas that she knows about so if she sees something she wants we just add it to the list and it helps avoid the temper tantrums almost every time! 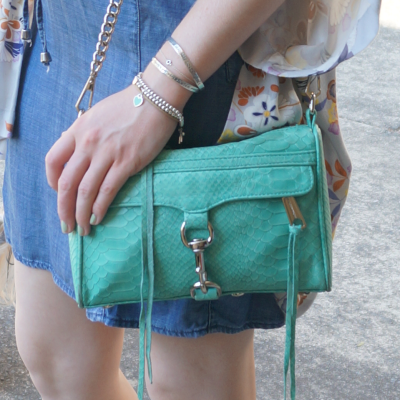 Loving the first Rebecca Minkoff bag so much! Oh that first look totally rocks Mica !